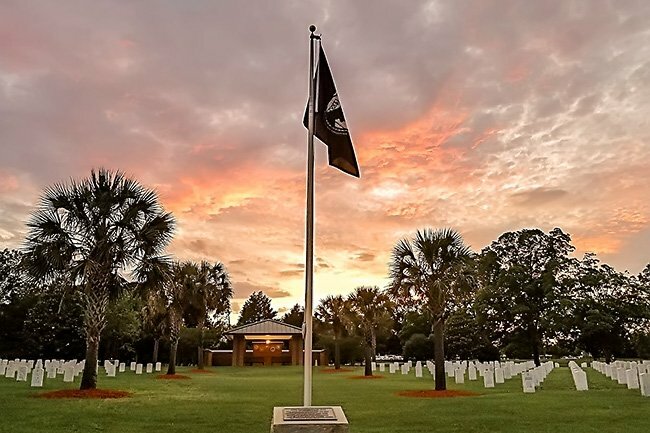 This historic cemetery in Florence dates to the Civil War when Confederates built the Florence Prison Stockade near this site to detain Union captives. Constructed in September, 1864, the stockade’s design mirrored that of another CSA prisoner-of-war camp in Andersonville, Georgia. The prison took 1,000 Union prisoners more than three days to erect, and within its first month of operation it housed 12,000 prisoners. The conditions of the stockade were woeful and dangerous. The necessary staples of survival were scarce, and prisoners subsisted mainly on cornbread, molasses, and rice – when available. In the first months of operations, around 20 to 30 men died each day while imprisoned within the stockade, which was protected from the elements by little more than the trees overhead. Even after the United States Sanitary Commission sent supplies to the camp in October, 1864, conditions for the Union inhabitants failed to improve. When barracks were constructed for use as a prison hospital, around 800 men were admitted. The prison camp was widely criticized, instigating a policy of paroling the sickest prisoners. As a result, the number of prisoners significantly decreased as winter weather led to more illnesses and subsequent parolees. By January of 1865, the death rate in the prison camp had dropped to around six a day. By February, the camp had been deserted. 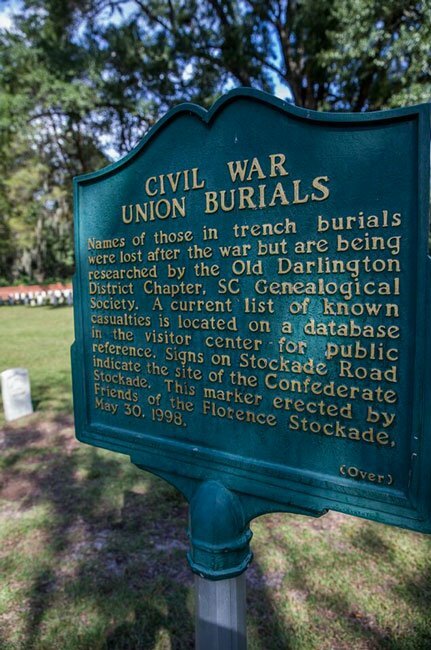 The deceased soldiers from the camp were buried in trenches on property adjacent to the stockade owned by Dr. John Jarrott, a Union sympathizer. Trenches were dug on his plantation, and Union troops were buried in two locations. A smaller site contained the bodies of 400 soldiers, while a larger site held the remains of 2,300 troops. 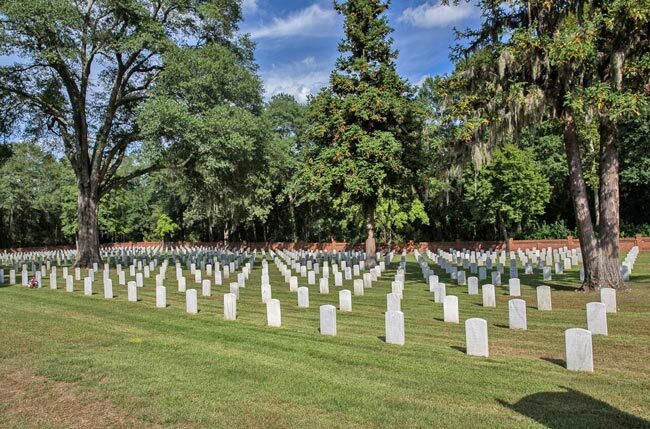 It was this larger area that became the Florence National Cemetery in 1865. 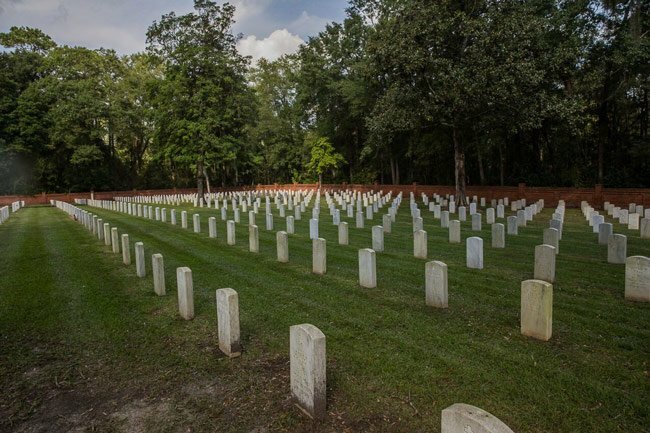 The 400 men interred within the smaller site were later re-interred in the cemetery. The original cemetery land was enlarged in 1942 with the addition of two acres. A brick wall surrounding the original cemetery, seen below, was built in 1877. A newer section of the cemetery was added in 1984 with the acquisition of 19 acres southeast of the original burial site. 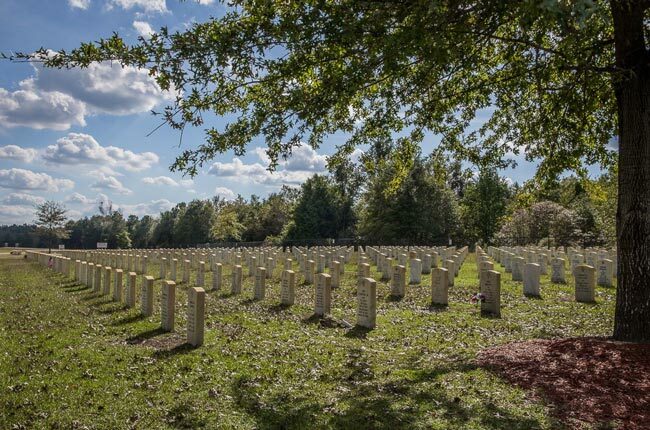 The first female service member to be interred within a national cemetery rests within the Florence National Cemetery. 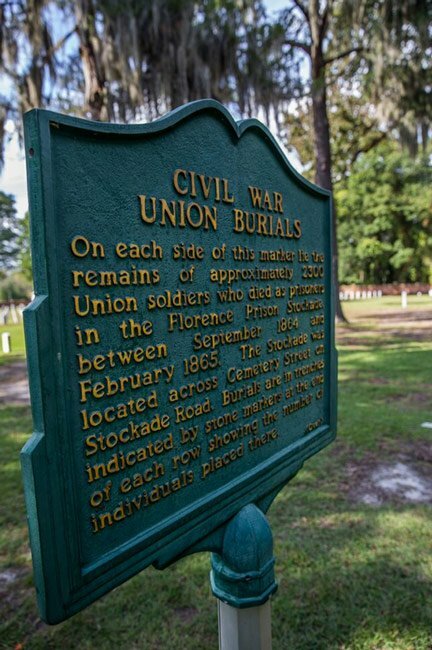 Disguised as a man in order to search for her husband, a Union soldier, Florena Budwin was captured in Charleston and sent to the Florence stockade in 1864, where she became ill. Her gender was soon discovered, and upon her brief recovery she remained in the stockade and served sick soldiers as a nurse until she relapsed and died in January of 1865. She was buried here with full military honors.